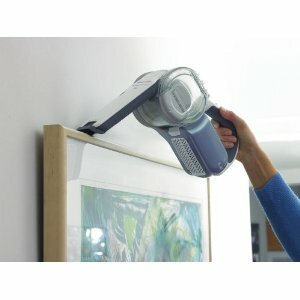 Wow, you can really access any little crevice with this fine hand held dustbuster! The first thing you notice about it is not only how small it is (we previously owned the model before – PV-1805), but how prominent the transparent bin container is, which will no doubt alert you visibly when full. When handling, it’s clear that this Black & Decker product has been designed to perfection. The nose can be rotated as such to access some of the more difficult areas where dust gathers. We’ve used it easily on picture rails, on the top of TV/amplifier units and also in dusty corners of the bedroom. This product is so easy to use, it’s difficult to find a fault. It uses cyclones to spin the dust away from the air so as not to clog the filters (common technology these days). You can also pull the nose out further for any difficult to reach spots. I found this works like a charm in our garage where dust/cobwebs are formed in corners we find difficult to reach. 18V power is enough for what this hand held beauty is made for. Simply whip it out whenever you spot some dusty areas in preparation for the in-laws visit! Why have others bought this product? 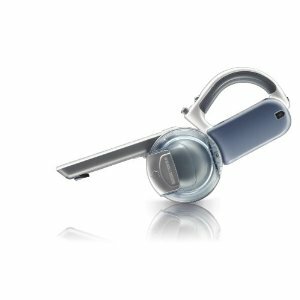 The dustbuster is a brilliant product from Black & Decker but you may as well buy a normal handheld vacuum cleaner?